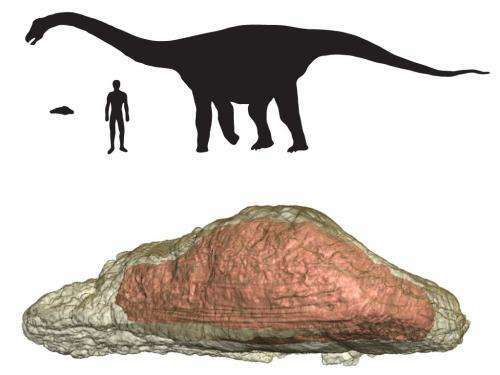 Guelph biomedical scientist Matthew Vickaryous co-authored a paper published today in Nature Communications about two sauropod dinosaurs  an adult and a juvenile  from Madagascar. The study suggests that these long-necked plant-eaters used hollow "skin bones" called osteoderms to store minerals needed to maintain their huge skeletons and to lay large egg clutches. Sediments around the fossils show that the dinosaurs' environment was highly seasonal and semi-arid, with periodic droughts causing massive die-offs. "Our findings suggest that osteoderms provided an internal source of calcium and phosphorus when environmental and physiological conditions were stressful," he said. As a researcher in the Department of Biomedical Sciences in Guelph's Ontario Veterinary College, Vickaryous studies how skeletons develop, regenerate and evolve. He worked with paleontologist Kristina Curry Rogers and geologist Raymond Rogers at Macalaster College in Minnesota, and paleontologist Michael D'Emic, now at Georgia Southern University on the study. Vickaryous helped to interpret the results of CT scans and fossilized tissue cores taken from the dinosaurs. Shaped like footballs sliced lengthwise and about the size of a gym bag in the adult, these bones are the largest osteoderms ever identified. The adult specimen's bone was hollow, likely caused by extensive bone remodelling, said Vickaryous. Osteoderms were common among armoured dinosaurs. Stegosaurs had bony back plates and tail spikes, and ankylosaurs sported heavily armoured bodies and bony tail clubs. Today these "skin bones" appear in such animals as alligators and armadillos. Such bones were rare among sauropod dinosaurs and have appeared only in titanosaurs. These massive plant-eaters included the largest-ever land animals. "This is the only group of lon-necked sauropods with osteoderms," he said. This sporting terminology might by fine for some people that do not have a measuring stick but I would rather have an actual size. Is the GYM bag full of stuff? is it an adult persons GYM bag? a mans Gym bag? a womans gym bag? Just what sized gym bag is it? Is a volley ball about 30 cm in diameter of is it 25cm in diameter or does it matter? Plus what sort of football are we talking about? union? League? Soccer? Aussie rules?